How do you go about looking for love? Is it in the sky or the water or even in the ice? Join penguin on his confusing journey in search of love. Penguin finds a mitten that is not really a mitten and starts knitting its pair. As he knits, he finds others in need of his woollen creations and so begins his adventure. As he gives with an open heart a parallel mystery unfolds. Where has all his wool disappeared to? Penguin in Love leads us to unexpected places, but with the help of friends, an open mind and a lot of knitting, Love is indeed to be found. 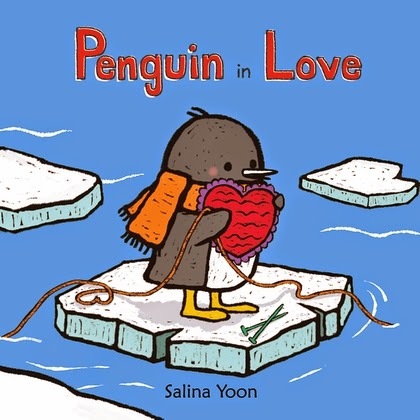 Salina Yoon’s cartoon illustrations of penguins and lovebirds bring colour and joy to this Antarctic tale. Penguin in Love will help little ones drift off into dreams about friends, giving, and a lot of wool.